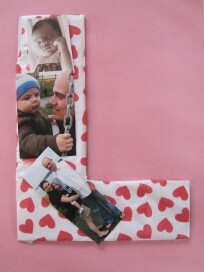 When we made our Create A Face Sticky Easel it was such a hit it stayed on our easel for AGES. For weeks, it changed a little by little but I didn’t take it down for a long time. I knew then that I would be making a holiday version of a sticky easel. 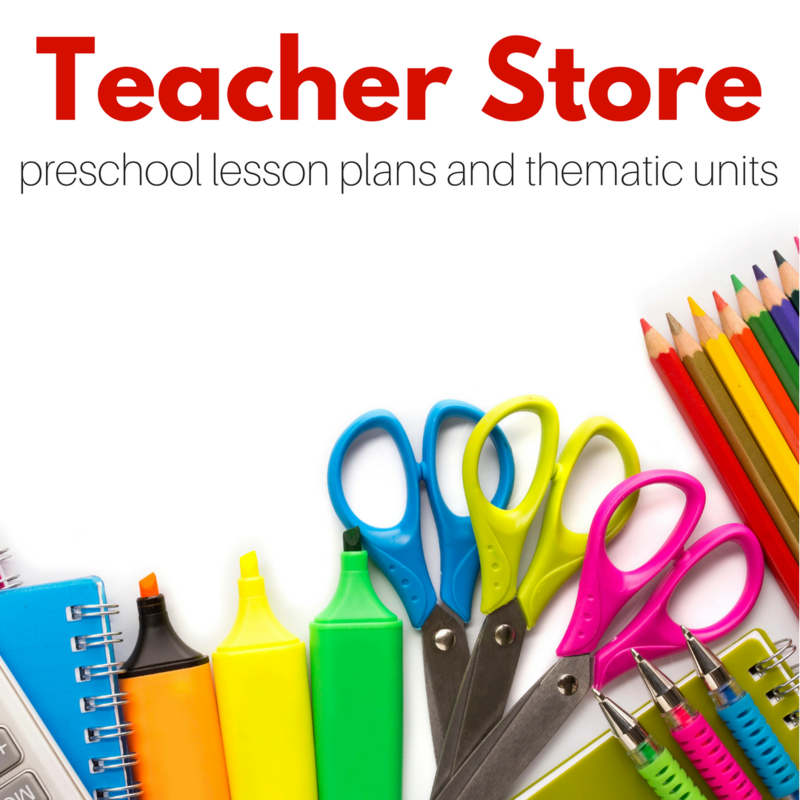 This is a great Christmas activity for preschool free choice time. 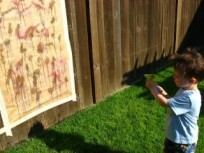 The project can be a cooperative art project in class. With activities like this, our role is to set it up and invite them to create. This isn’t a directed craft or step by step activity. It’s a creative buffet and kids can serve themselves. 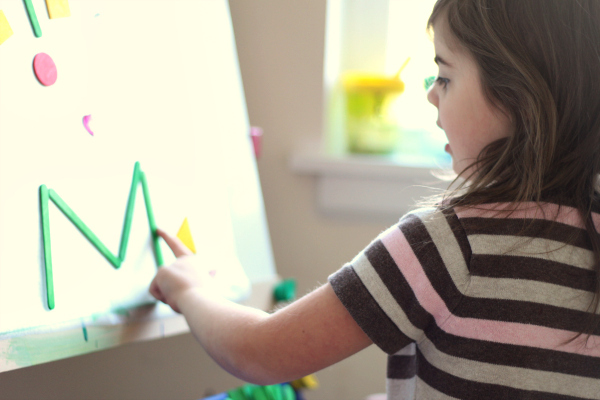 Let me show you how we set up this sticky easel and how my daughter created with it. Gather your materials. 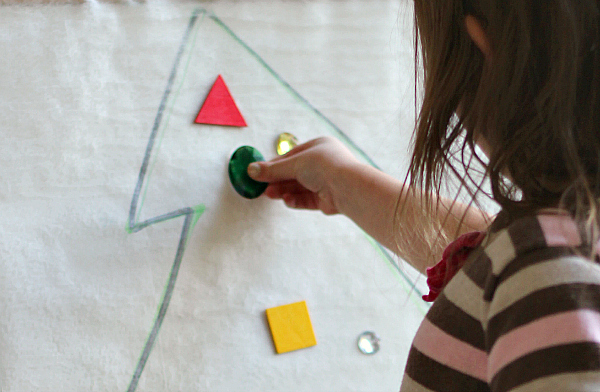 The only thing you really need for this Christmas activity for preschool is contact paper. Good sticky contact paper. 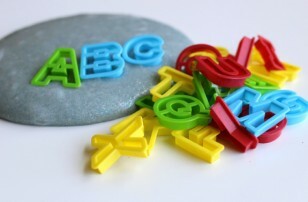 Substitute what you have on hand to make the project work. Heck, you don’t even need an easel, you can pop it up on the wall. 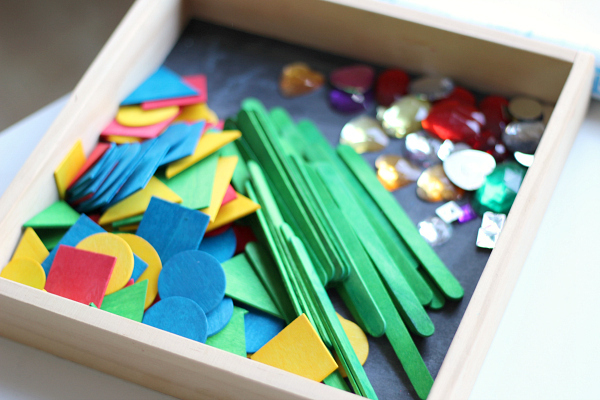 We used green popsicle sticks, colored wooden shapes, and gems. 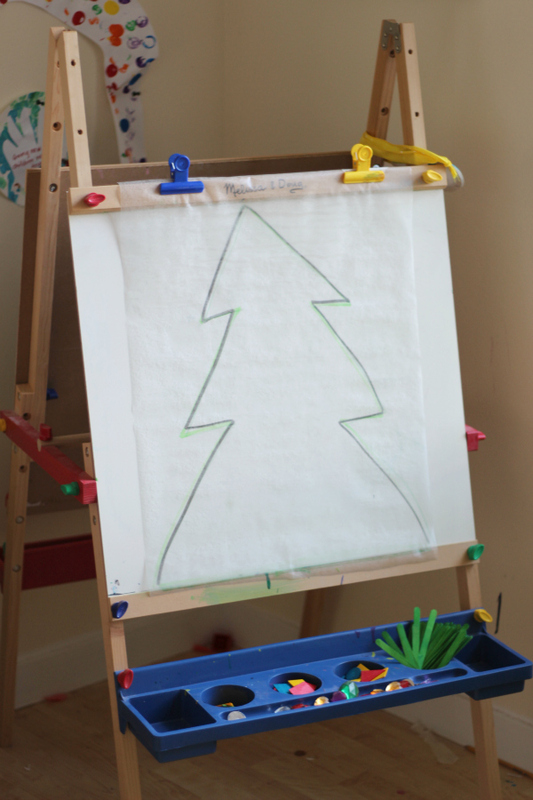 I also used a dry erase marker to make an outline of a tree on the easel as a guide. Start by drawing the outline of the tree. Peel the backing off the contact paper and secure it to the easel. 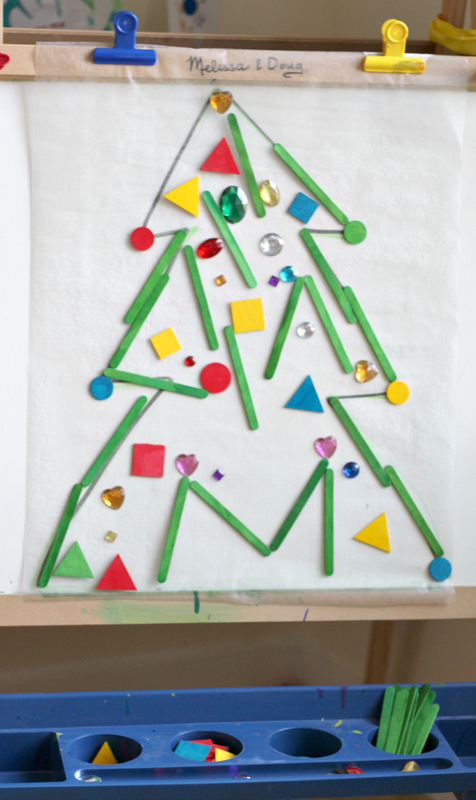 Place the bits and pieces into the easel and invite your tree trimmer to come trim the tree! She started off with the shapes and gems. Then discovered she could make letters with the popcicle sticks. 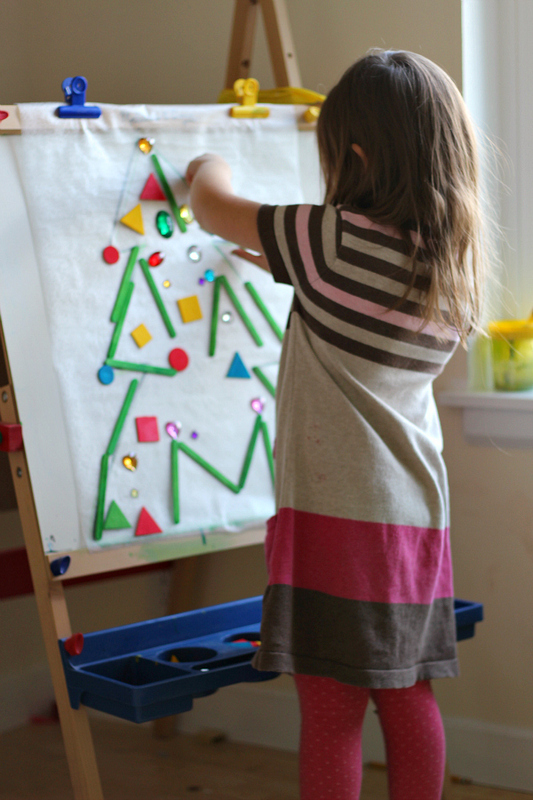 This sticky easel is filled with tactile exploration. 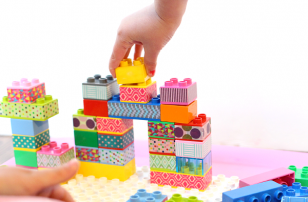 It’s a wonderful activity for those “must be perfect” days that seem to crop up from time to time with preschoolers, since the items can be added then removed i. 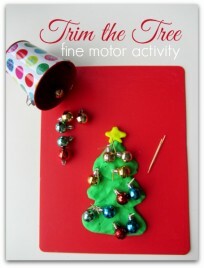 This activity also works on so many skills like fine motor, shape recognition, and counting. 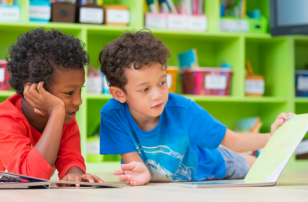 Don’t force the skills or use the time to quiz your kids just be there to catch the opportunity to talk more about their observations if they make them. For us the observation I jumped on was about how think the gems were vs. how thin the wooden shapes were. She didn’t like that I used black for the outline so she covered it up with more sticks. I sat back in our book nook with my camera and listened to her chatter away ( which if you are a parent that has had a child in speech therapy chattering is music to your ears, especially when it’s perfectly easy to understand). Our playroom was ready for Christmas once complete, thanks to this adorable Christmas activity for preschool! Where do you get the flat/colored wooden shapes? My Googling is weak this morning.